The Bible vs. 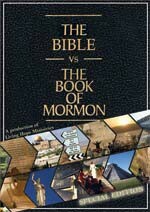 The Book of Mormon is Living Hope Ministry's follow-up to their popular and powerful 2003 video, DNA vs. The Book of Mormon. The Bible vs. The Book of Mormon asks the same questions of the Bible and of the Book of Mormon to see if the facts confirm what the two books state is true. Now if I were Mormon, I would really want to see this video, even though a Christian ministry produced it. The opening statement of the Book of Mormon claims to be "a volume of holy scripture comparable to the Bible," and the Book of Mormon is supposed to be "the most correct book" on earth and the "keystone" of Mormonism (Introduction page of the Book of Mormon). These two statements set up the challenge. If the Book of Mormon truly is the most correct book on earth, then outside sources would surely confirm its truth as a historical document. The Bible vs. The Book of Mormon video looks at the geography of Israel and of the Americas, people groups, cities, plants and animals, coins, weapons, historical figures, temples, and linguistics. The Bible passes the challenge of being a historical document because we know where Jerusalem is today, for example. The Babylonians and Philistines have proven to exist from outside archeological sources. Most of the plants and animals mentioned in the Bible still exist in Israel today. Outside sources such as the writings of Josephus confirm that King David, King Solomon, and Jesus existed. Yet there is not one source outside of the Book of Mormon that validates any person out of hundreds mentioned therein. Plus, there is no mention of any New World cities out of 30 plus major cites that the Book of Mormon claims existed. The Mormon Church does state that the hill Cumorah which is located in upstate New York is the hill where the Nephites where destroyed by Lamanites in 421 AD. The Mormon Church owns most of the area around the hill Cumorah and the hill itself. So why doesn't the Mormon Church start major excavating of the area and prove that this great battle took place? The Church must be assuming that they would find nothing, proving that no great battles ever took place there. Since there is not one New World source outside of the Book of Mormon even mentioning a single person, a single place, or a single event, this would seem to prove the Book of Mormon is a 19th century religious fairytale. Although this video is extremely well documented, interviewing numerous credible scholars (including LDS scholars), and very convincing, it still doesn't go in depth as much as it should in certain areas. For example, the video claims the Book of Mormon is completely wrong when it mentions Jesus being born in Jerusalem, not in Bethlehem (Alma 7:10). Actually, what the video did not point out was that the Book of Mormon passage goes on to describe Jerusalem as a "land" rather than a city. Now theoretically speaking, if there was an Israelite migration to the New World, they could have referred to the city of Bethlehem as being in the land of Jerusalem, since Bethlehem is only about five to six miles from Jerusalem. (For more on this, see here.) But of course the only validation we have that they (in contrast to other supposed accounts of others in the Old World) did in fact speak that way comes from the Book of Mormon. The Bible vs. The Book of Mormon also states that the Nephite "coins" were made of metal (Alma 11). This is another argument that has been brought up many times before, but nowhere in Alma 11 does it specifically say that the "coins" were made of metal. The introduction to the chapter states that the coins were made of metal, but sophisticated Mormons say that the introduction isn't scripture, and thus not inspired. Where the chapter mentions the various sorts of metals accompanied with rather unfamiliar names, these Mormons claim these names could easily refer to units of measurement of some sort. One could make these counter claims, but it's still not a strong enough argument to overlook the more compelling evidence, such as the lack of cities, plants, animals, and people mentioned in the New World of the Book of Mormon. Nothing of this sort has turned up outside these pages. Mormons have not met the burden of proof. But of course none of this will bother Mormons who want to stick their heads in the sand and persist in their affirmation of the truthfulness of the Book of Mormon. At the end of the day, proof is irrelevant. They may simply claim that scientific research just hasn't turned any of it up yet. I strongly encourage everyone reading this review to order a copy of this video. Believe me, you will not be disappointed. For more information on The Bible vs. The Book of Mormon, including how to order a copy or watch it online, please visit here.